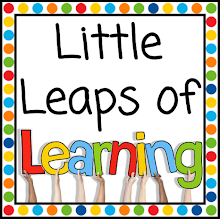 Little Leaps of Learning: Welcome! Welcome to Little Leaps of Learning! This blog has been in the works for quite a long time. I first discovered the blogging world in December 2011. I was awestruck by the amount of knowledge and creativity out there! I knew immediately that I wanted a blog of my own, however at that stage I had only 12 months of real-life teaching under my belt. I didn’t feel like I had anything to offer. For another year I followed the blogging world from the sidelines, gradually becoming more and more excited about finding my own place within it. Now I'm going into my third year of teaching and I'm very excited about using this blog to try out new ideas and document my learning. I've started this blog because I'm inspired daily by the other amazing, creative, motivated teachers at my own school and I want to be just like them. We constantly say to our students "be the best that you can be", and it sounds corny, but I want to be the best teacher I can be. Why the name 'Little Leaps of Learning'? Well, nothing beats a catchy alliteration. I also love seeing my students make those bounds of progress, whether big or small. There is nothing more rewarding for a teacher than the delight and excitement on a student's face when they have mastered a new skill, and their eagerness to know what the next step is for them with their learning. I plan on posting on this blog once a week or fortnight at most. It takes 21 days to create a habit - so let's see how it goes! A special shout out to Melanie from Adorability Designs for her blog design. I highly recommend Melanie if you are after a custom made blog. She is a joy to work with - enthusiastic, professional and very skilled. Nothing was too hard for her, even my fussiness and indecision. Go and check her work out at http://designs.adorability.org/.